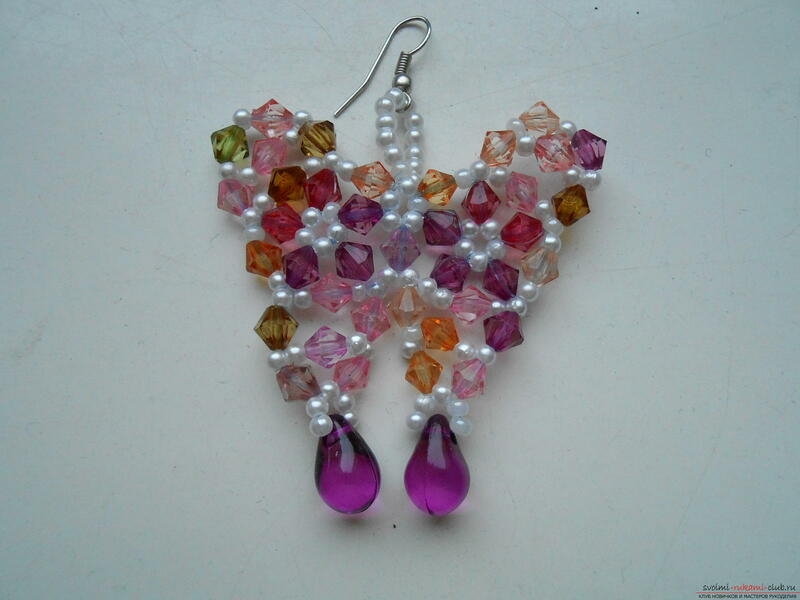 That's why once on a frosty December evening I wove a butterfly from beads. 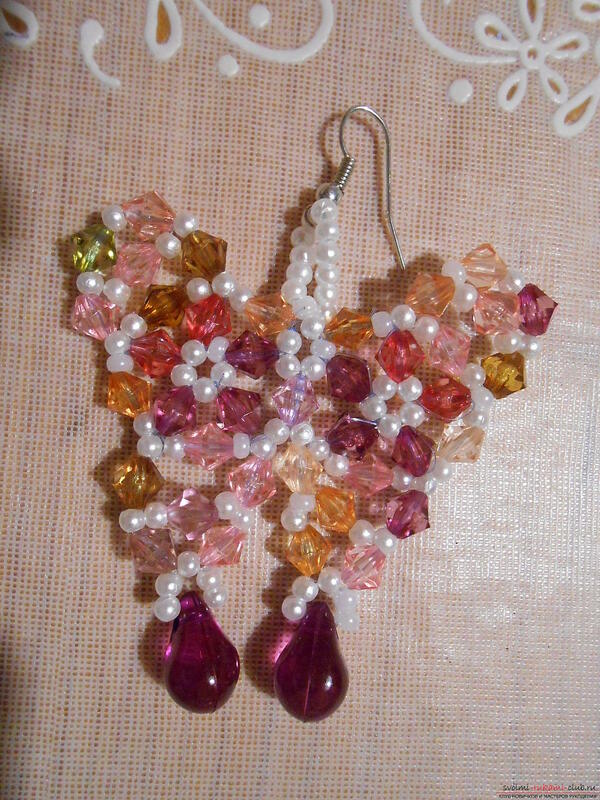 I used crystals and small white beads, andas scarlet "drops" in the tone of the crystals used. I prefer to weave on the line. Durable. Reliable. You can take monofilament. It's up to you to decide what to choose. Let's start weaving. 1. 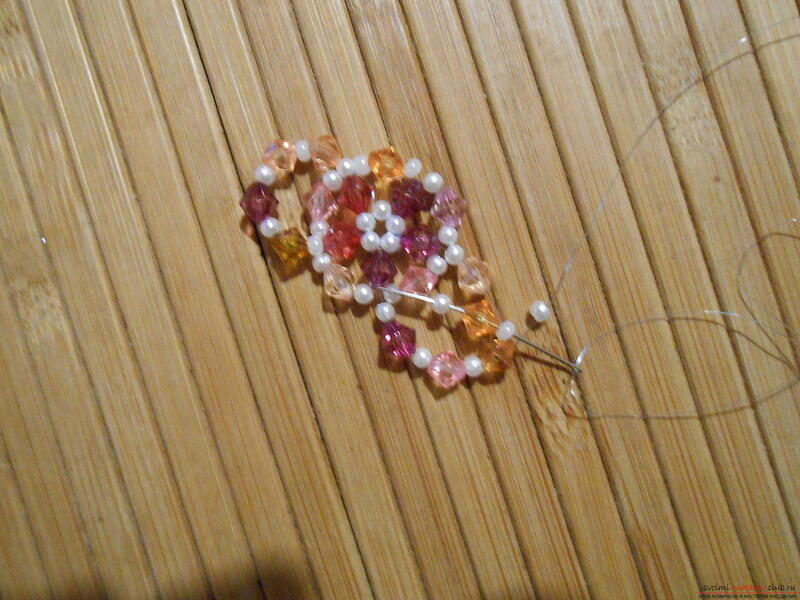 We type on the needle 5 white round small beads. 2. 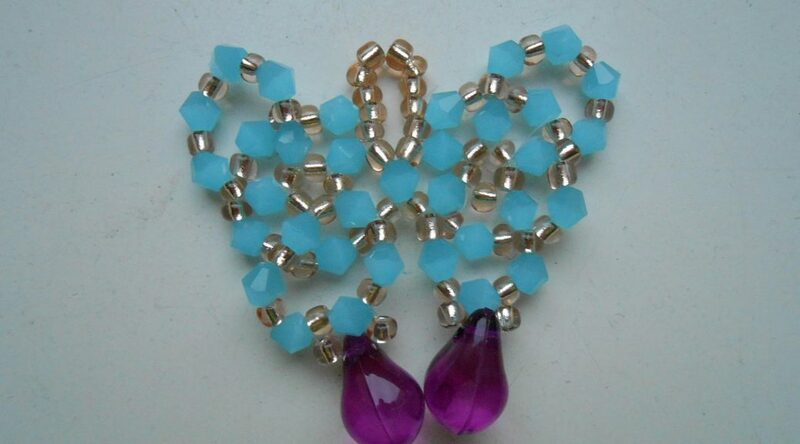 We connect beads in a circle. We bind the thread of the weave and the end of the thread. Walk a few times with a needle around this circle for strength. 3. 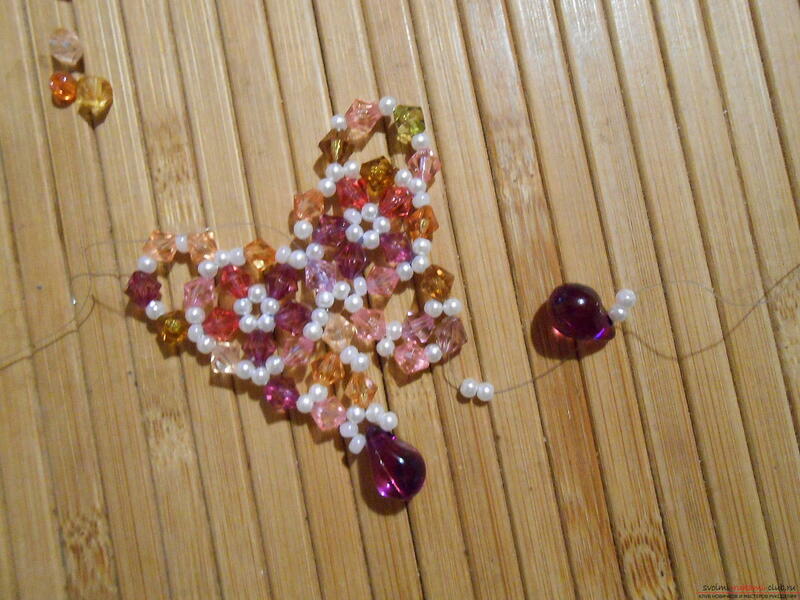 Between each bead paste on the crystal. 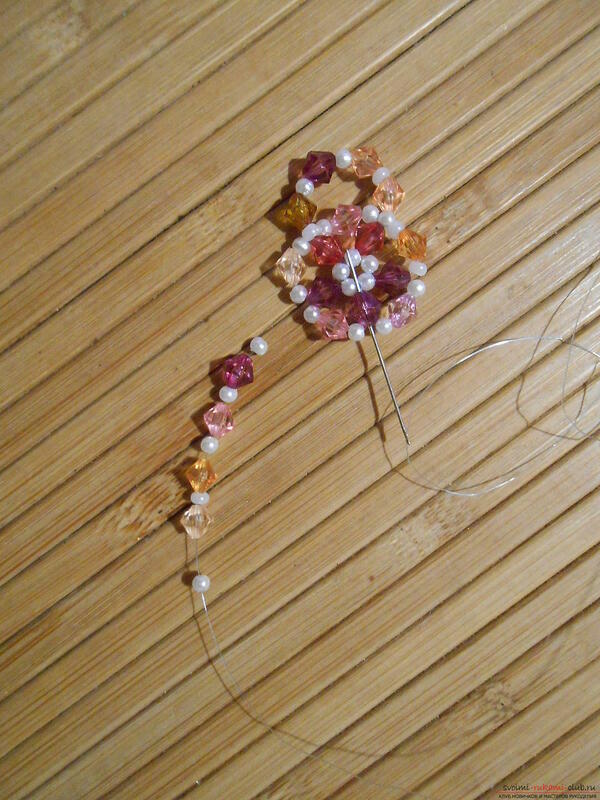 The crystals will stand in their narrow part to the bead. The crystals all look up from the center. 4. We leave the crystal. 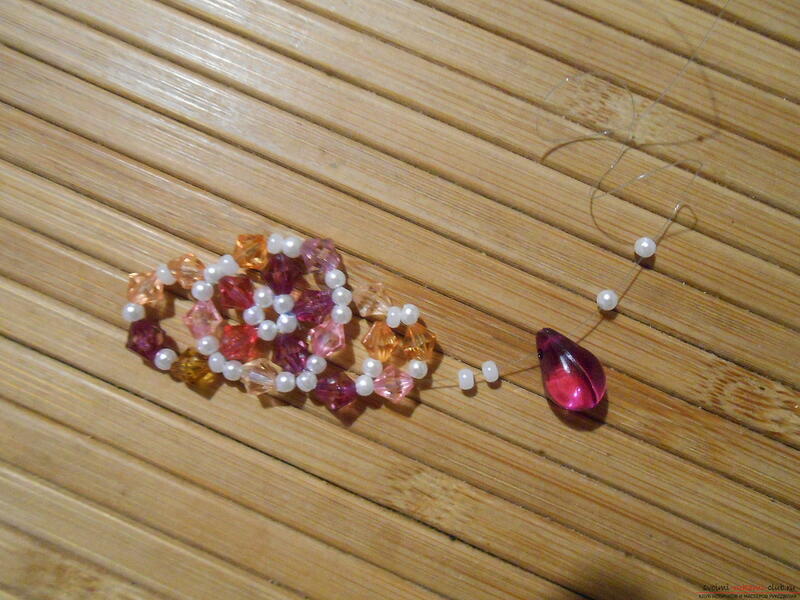 We type on a needle a bead, a crystal, a bead. We enter the next crystal. 5. We pass the entire circle, creating another circle above the first central circle. 6. We leave from the crystal of the central circle, which looks upwards. 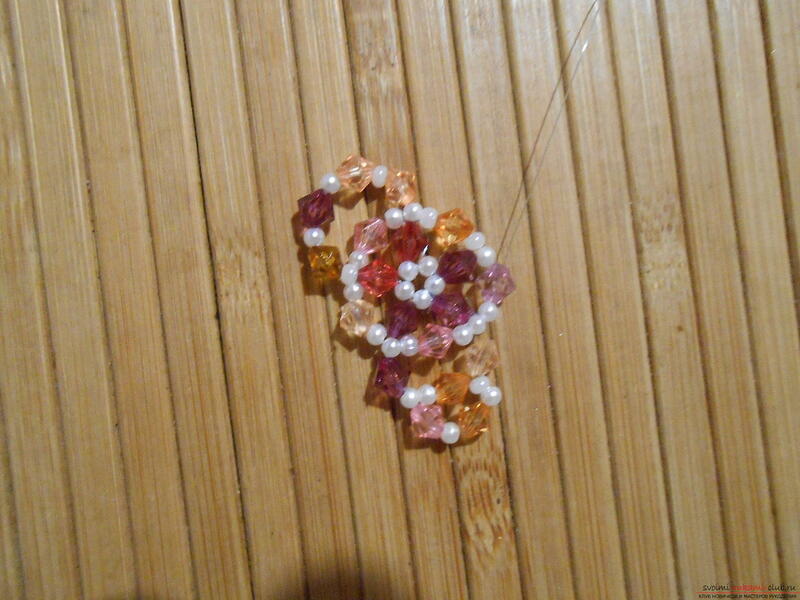 We type on the needle, alternating, 5 beads and 4 crystals. 7. Enter the next crystal looking up. 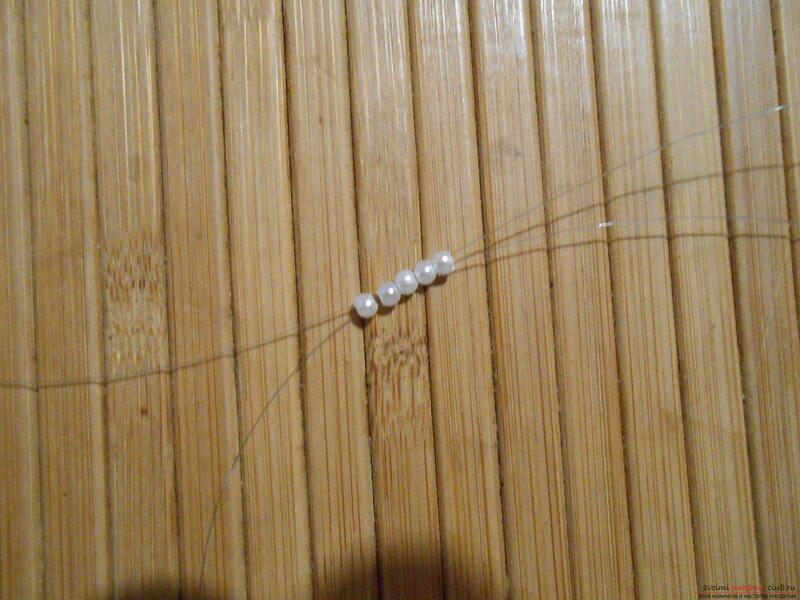 We pass with a needle through the formed circles twice for the strength of the weaving. 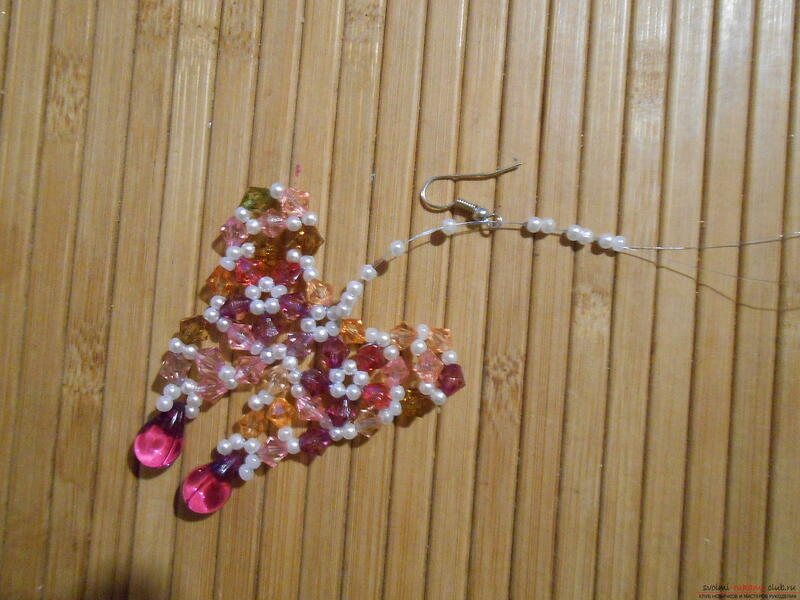 So we wove the upper wing of a butterfly. 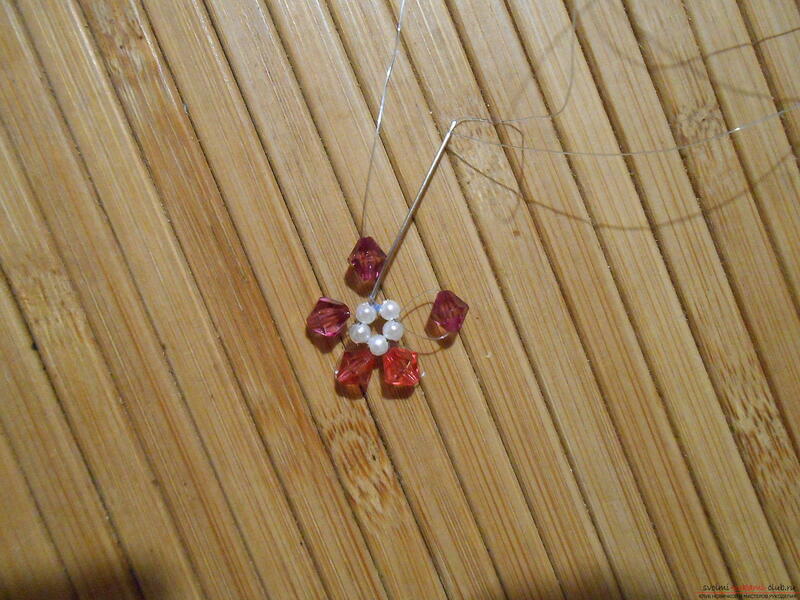 Going out to the next crystal looking up, we dial again 5 beads, 4 crystals. We go into the next crystal, looking up. So we wove the lower wing. 8. 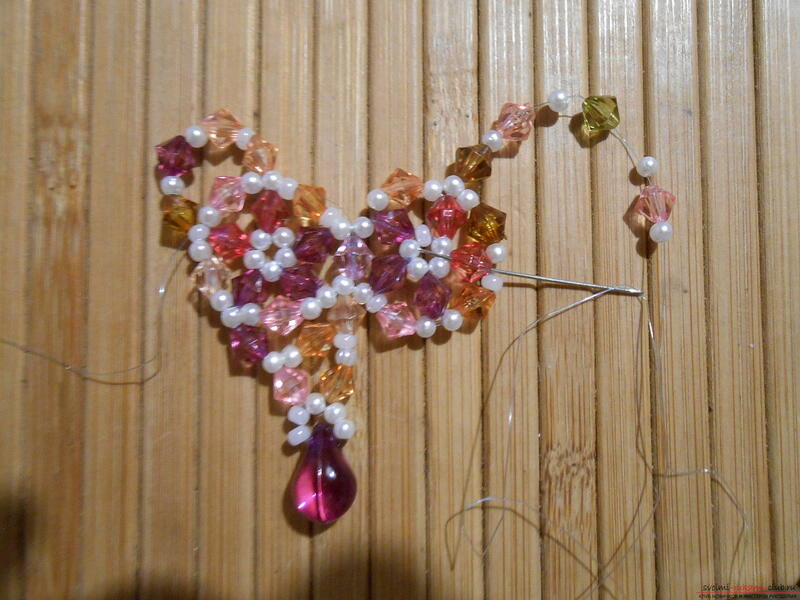 Inside the lower wing we will insert another crystal with two beads. 9. 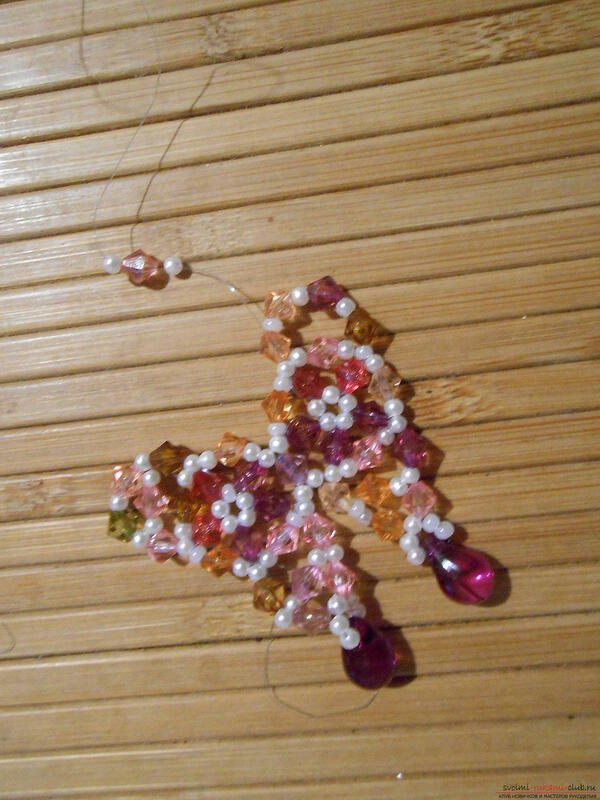 To the lower bead of the lower wing we weigh a drop and 4 beads. We do this so that the drop is in the center. 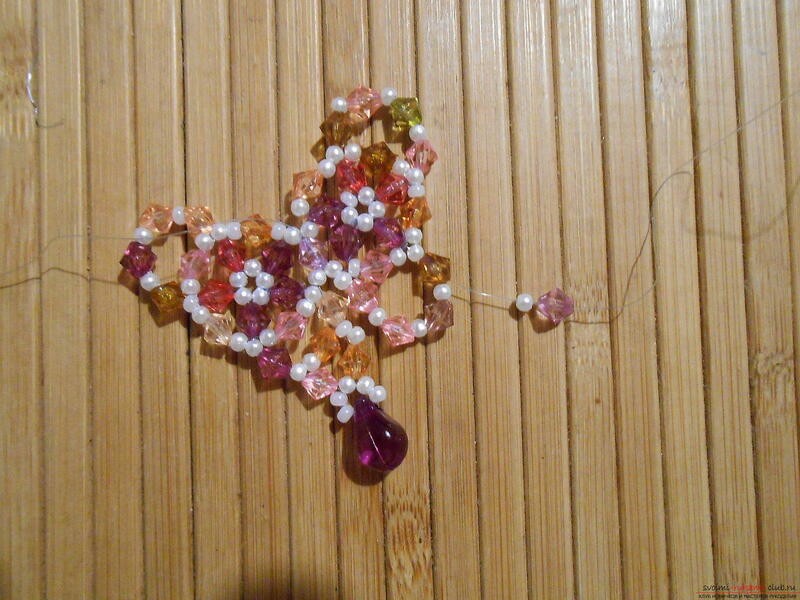 And above it 5 white beads. 10. 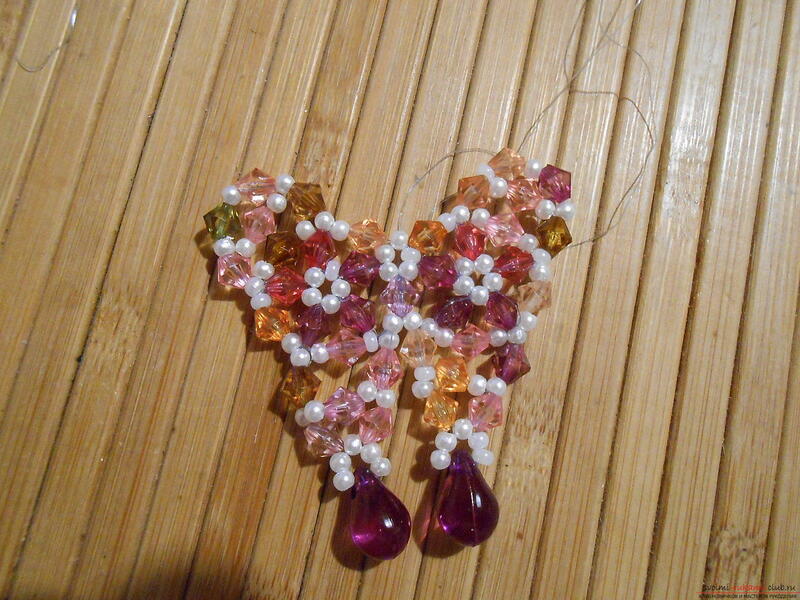 The first half of the butterfly is woven. 11. We begin to weave the second half. For this we begin the weaving from the beginning. 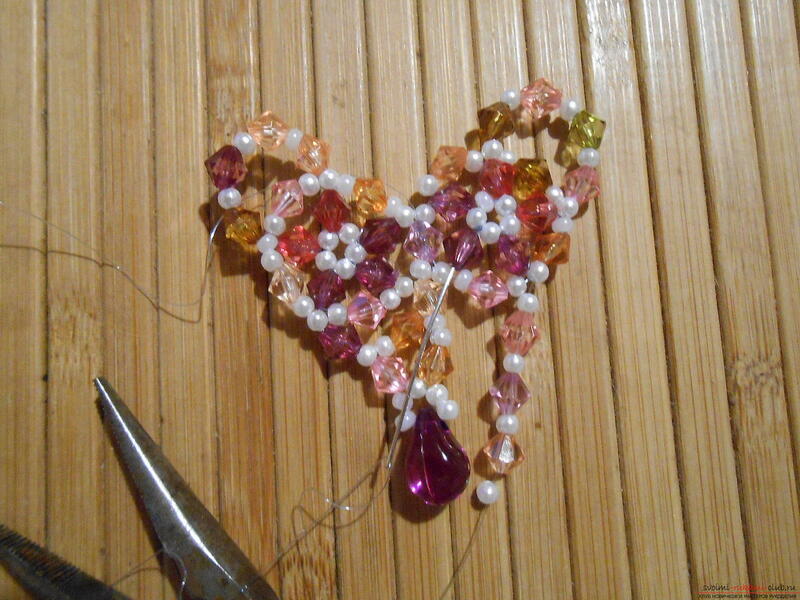 Repeat all the steps from 1 to 5 weaving the first half of the butterfly. 12. We pass above the central circle over 4 crystals. 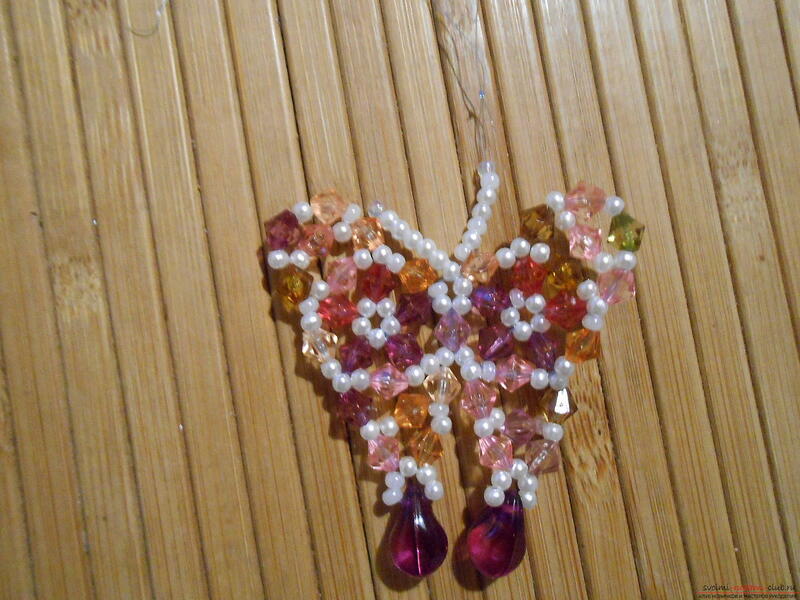 5 The crystal will be common with the other half of the butterfly. 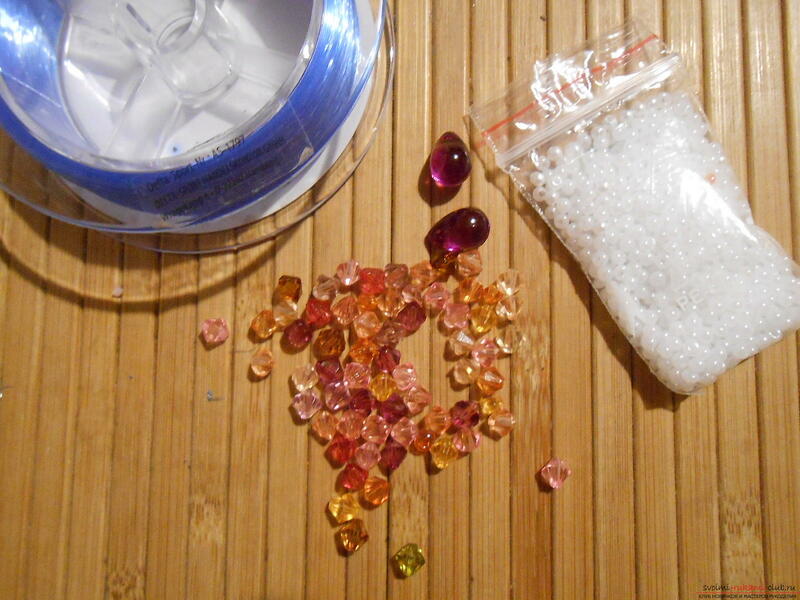 We type a bead, a crystal of the first half, a bead. The circle is closed. 13. The upper wings are trimmed symmetrically to the first wing. 14. The plait of the lower wing is symmetrical to the first. 15. We weave a "drop" to the bottom wing. 16. 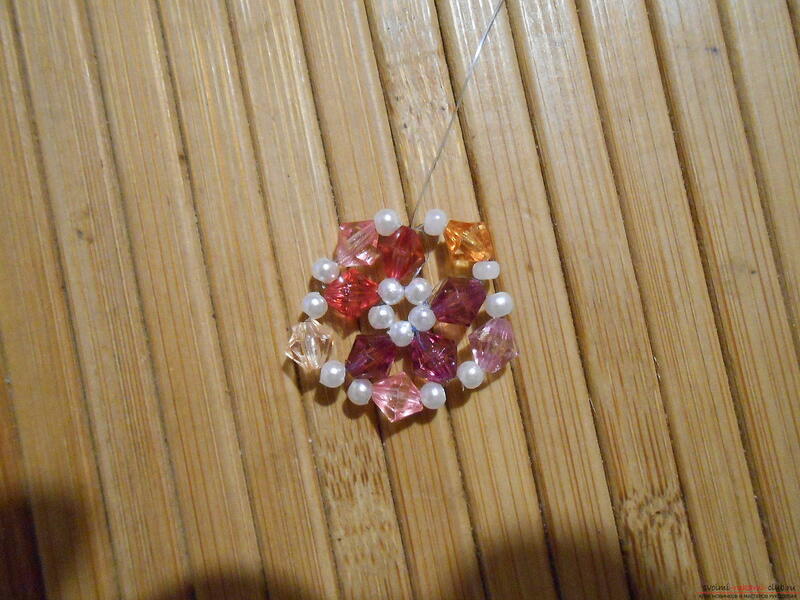 We weave the crystal inside the lower wing. 17. 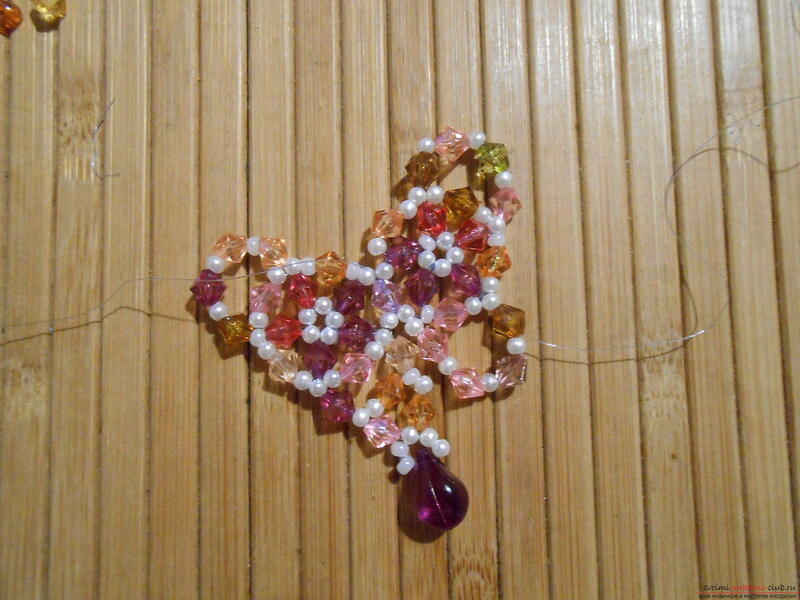 And in the upper wing I decided to weave another crystal and 2 beads. We do similarly, as on the lower wing. 18. 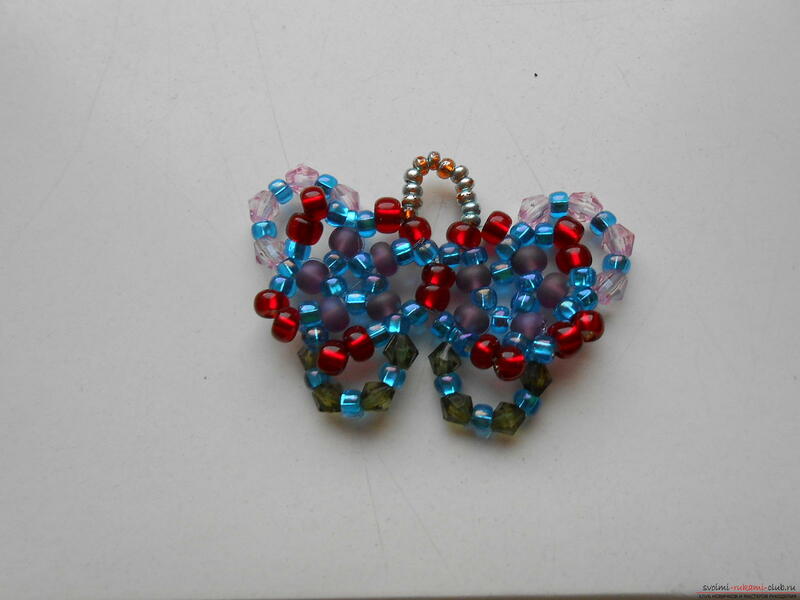 Here's a butterfly turned out. 19. 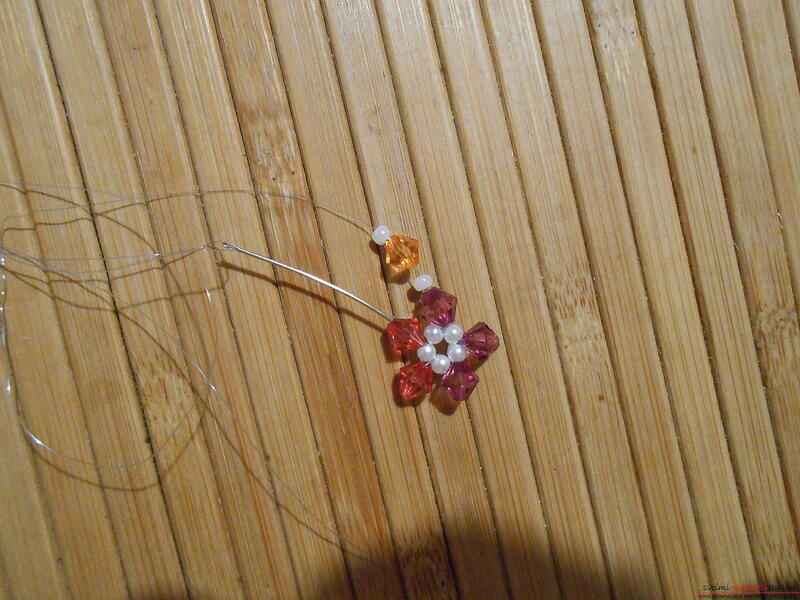 It remains to weave the antennae. 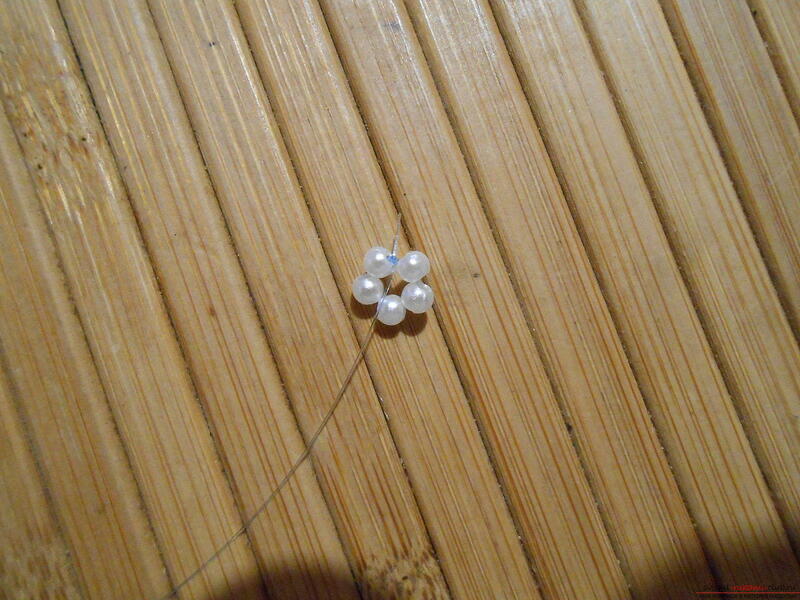 We leave the central white beads. 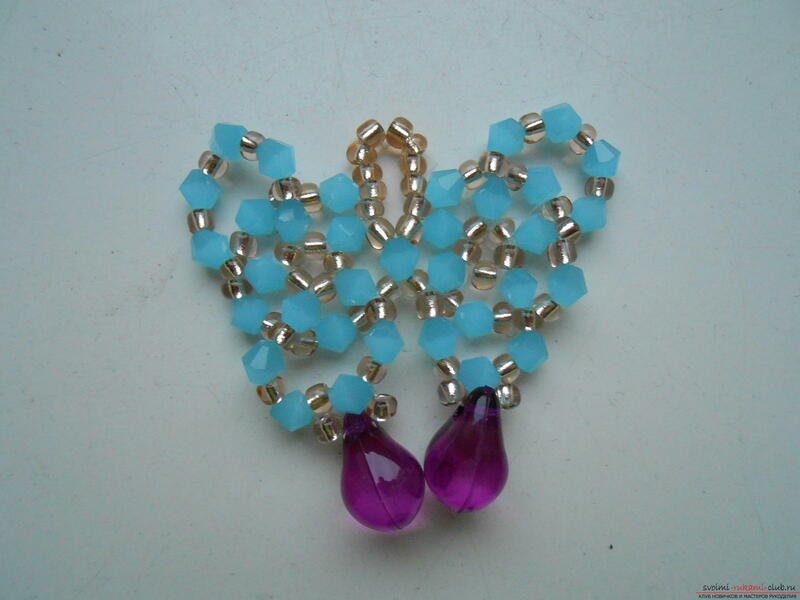 We dial 12 beads on both sides. 20. 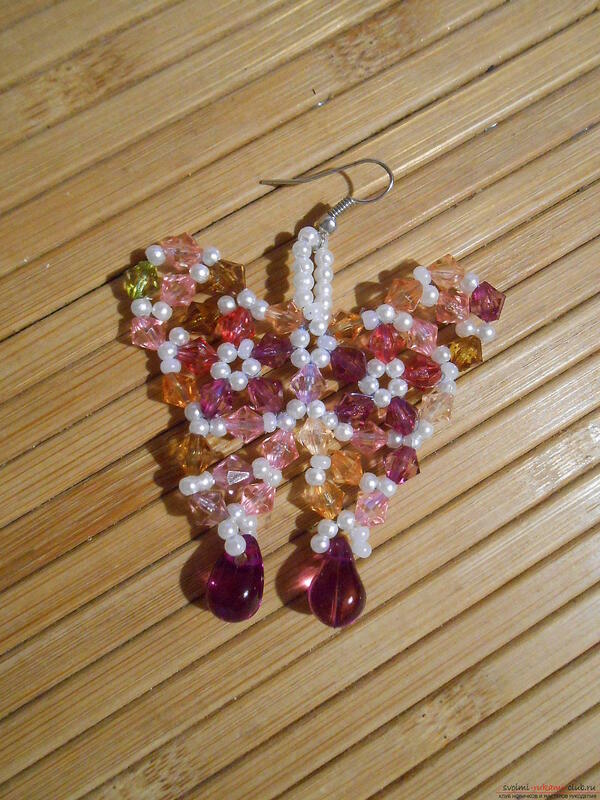 Such a butterfly can be used as an earring. 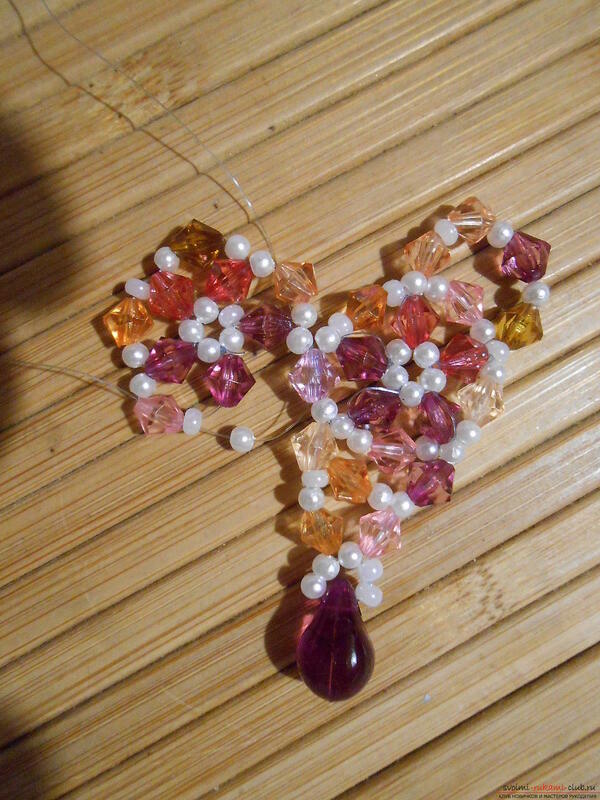 In this case, we put the shvenzu on a loop of beads, coming out from one side and entering the other side in the center. Well, and if you do not put a schwenze, then it will be a fine suspension, a beautiful decoration at any time of the year. 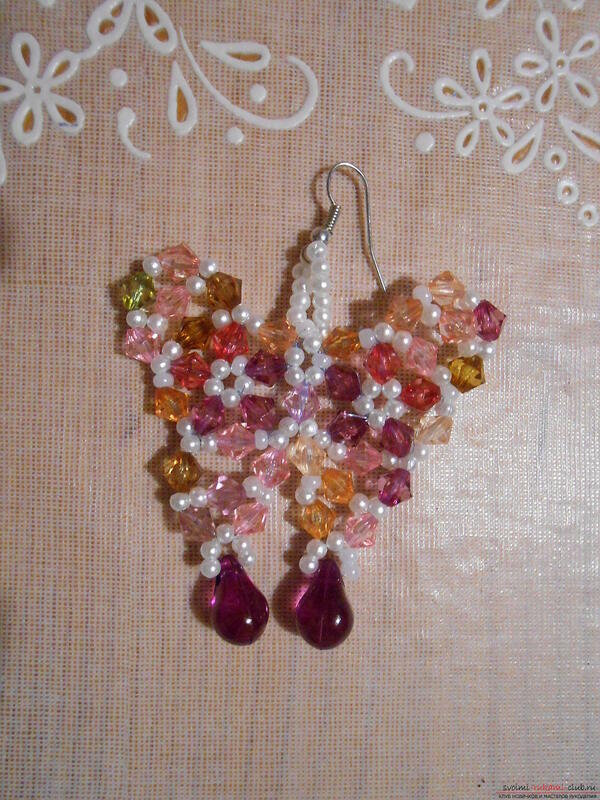 And here are more variants of my "Butterflies". Do it! And your life will be beautiful and interesting. 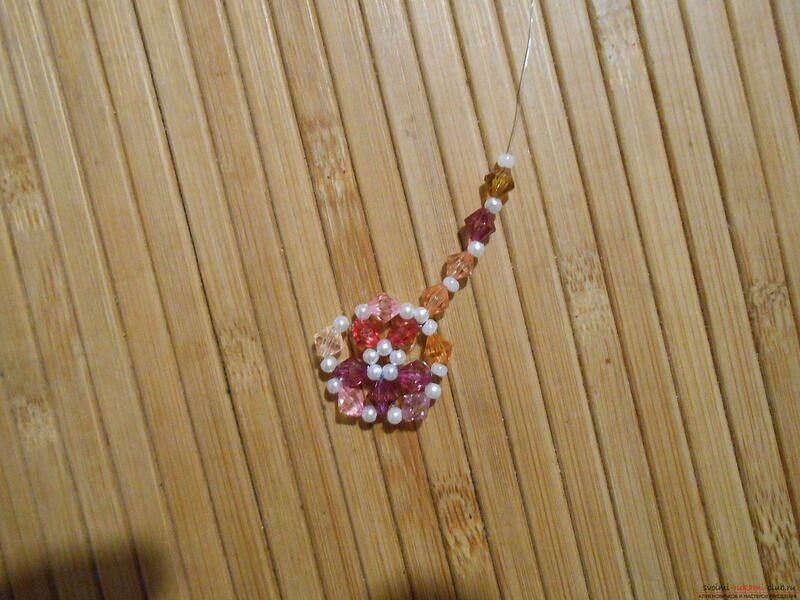 How to knit crochet flowers, tips and master classes with a photo.